Apu Nahasapeemapetilon: And I say you're a stereotype, spouting buzzwords like some hipster. Jay: Swipe left on that! Epic swipe left! Much Apu About Something is a good Simpsons episode with a reasonably well written storyline and some funny scenes. It's certainly enjoyable, I liked seeing the Kwik-E-Mart get transformed by Apu's nephew Jay, the dialogue between the two of them is certainly the highlight of the episode, particularly the scene where he insults Apu for being a stereotype. The story could have been more interesting, the relationship between Apu and his nephew should have been developed more in order to make the conflict extreme, making it more exciting for the audience, instead of just floating along with no real surprises for twenty minutes. 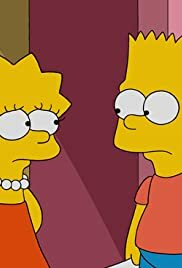 As for the side story, it had way more potential than it delivered, Bart giving up pranking is a big deal that the writers should have taken more seriously, but instead its just used a few times as filler, with nothing ever really happening other than reminding us that he is no longer pulling tricks on people. It has flaws and I expected better from an Apu episode, but Much Apu About Something is still an enjoyable Simpsons. Conflict arises between Apu and his nephew Jay after he transforms the Kwik-E-Mart in to a more up to date store.